Below is our review of the NATPC M009S, a 7" tablet, featuring a All Winner A10 - 1.2GHz processor and 8GB memory, with 6 Hours battery life. The NATPC M009S is a 7" Capacitive Touch tablet, with 8GB storage (upgradable via the MicroSD slot), a 1.2 GHz processor, 400 MHz graphics card all running on Android's Ice Cream Sandwich - all for an astonishingly cheap price of under £80. NATPC may not be the best known brand name - however at around a quarter of the price of an iPad, we don't consider this an issue. Battery life is around 6 hours - so this 7" tablet is highly portable, with a weight of just 356g, and overall dimensions of 19.8cm by 11.7cm by 0.98cm - making this tablet fit easily inside your bag. The lower cost and smaller size of this tablet, when compared to an iPad, mean it will be more practical when travelling, as well as less of a risk for both theft and breakage. The build quality feels good – despite the low price tag, it appears to be well made, and as it’s only 19.8cm long, there’s virtually no flex in this device. The 7" screen is adjustable, and easily calibrated as well, enabling you to tailor it to your preferences and environment - adjusting it so you have slightly less brightness will prolong the battery life. The screen is multitouch and highly responsive - navigating this tablet is fast and easy. You have access to Google's App store - with millions of both free and paid Apps at your fingertips, all easily downloaded and installed. Each app will automatically download and update to the latest version, thus eliminating any bugs or security issues. The tablet comes with 8Gb of storage - however you can easily buy a 32GB MicroSD card to insert into the provided MicroSD slot, thus giving you room for your entire music collection - this is a feature that many other tablets simply do not have, and at this price is a real advantage. It also has a micro USB port, enabling you to plug in an external USB device, such as a mini keyboard, if required. It also supports Adobe Flash player, something which an iPad doesn't (without upgrades) - and so no problems browsing the web, accessing YouTube and BBC iPlayer. 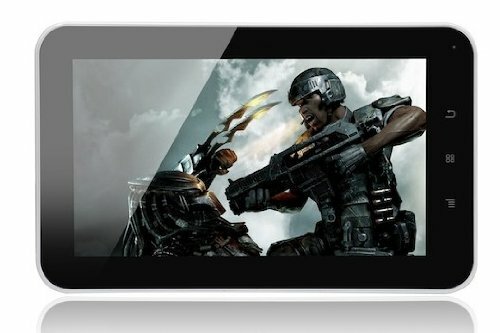 So who is the NATPC M009S 7" tablet aimed at? At this price, it's ideal for household web browsing, as well as a first tablet for children to use - it works well, looks good, and offers incredible value. If you're after a tablet, but are either on a budget, or simply can't justify shelling out hundreds of pounds, then we'd highly recommend this tablet. Pros: Incredible price, easy to customise, performs well, great features and offers very good value. Cons: None to mention - for the price we just can't criticise it. It may not be a well known brand, but the NATPC M009S offers great performance at an incredible price. If you're looking to buy a cheap tablet, then we'd highly recommend the NATPC M009S.